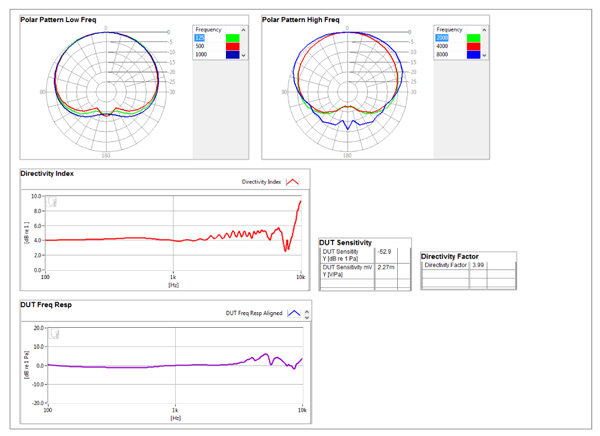 Microphone Polar Plot Substitution Method Using Outline ET250-3D – Listen, Inc. This sequence measures the directional response of a microphone and graphs the result as a polar plot. A log sweep stimulus is played from 100 Hz to 10 kHz at each angular increment, and the acquired waveform is analyzed using the Time Selective Response algorithm. This method allows the test to be performed in a non-anechoic environment by placing a window around the direct signal, eliminating the influence of reflections. Commands are sent automatically to the Outline ET250-3D turntable via an RS-232 connection, instructing it to move in 10 degree increments after each measurement. The sequence measures the response every 10 degrees from 0 to 180 and mirrors the polar image, which simulates a full 360 degree polar and saves test time. The response at each angular increment is compared against the on-axis response to create a normalized curve. This removes the influence of the device’s frequency response and sensitivity, such that the polar plot only shows the directional response. The final display also contains a graph of the directivity index in decibels versus frequency. Note: If testing past 20 kHz an AudioConnect 4×4 audio interface and SoundConnect 2 microphone power supply are recommended. For a LAN connection, connect both the Outline turntable and the SoundCheck PC to your LAN using appropriate network cables. The turntable’s IP address can be accessed by holding down the Stop button while powering the unit on. The address will be displayed on the turntable’s 4 digit alphanumeric display. Write this number down. Windows: Open Network and Sharing Center. Click on Local Area Connection > Properties > Internet Protocol 4 > Properties > Use The Following IP Address. Manually enter the same IP address as the turntable with the exception of the last digit (make sure the last digit is different). Mac OSX: Open System Preferences > Network > Advanced > TCP/IP > Configure IPv4: Manually. Enter the same IP address as the turntable with the exception of the last digit (make sure the last digit is different) and make sure the subnet mask ends with 0 (zero). There are two configurable parameters in the Outline Ethernet custom VI: network address and movement. 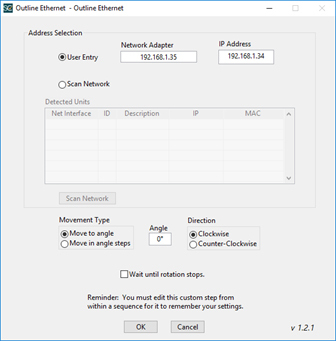 Automatic: Open the Outline Ethernet custom VI editor and in the Address Selection section, select Scan Network and then click the Scan Network button. SoundCheck will search for the turntable and automatically populate the address information into the Detected Units table. If the host computer is on both a LAN and wireless network, multiple instances of the turntable may be visible in the Detected Units table. Manual: Open the Outline Ethernet custom VI editor and in the Address Selection section select User Entry. Enter the host computer’s Ethernet IP address in the Network Adapter field and the turntable’s address in the IP address field. An example of a manual entry use case would be if you are writing a sequence which will be used at another location and you wish to enter the known address values of the destination site. Movement: There are three configurable parameters for turntable Movement: Type, Direction and Wait Until Rotation Stops. Type: The movement type options are Move to Angle and Move in Angled Steps. In Move to Angle, the user inputs a specific target angle into the Angle entry box. An example of this use case would be entering 0° to return the turntable to its Home position. In Move in Angled Steps, the user inputs the desired angular increment of rotation into the Angle entry box. An example of this use case would be entering 10° in order to move the turntable in 10° increments for measurement of polar data. Wait Until Rotation Stops: The Wait until rotation stops checkbox will cause the Sound Check sequence to pause and wait until the turntable stops moving before continuing to the next step. This is required in the first two Outline Custom Steps but not for the last step since it simply jumps to the final display. Connect the turntable ethernet cable to the ethernet interface on the computer. Connect Output 1 of the audio interface to the input of the power amplifier and connect the output of the power amplifier to the loudspeaker. Connect SoundConnect 2 outputs 1 and 2 to audio interface inputs 1 and 2. Connect the reference microphone to input 1 of SoundConnect 2. Connect the DUT microphone to Input 2 of SoundConnect 2. Use a phantom power supply if the mic requires 48V power. 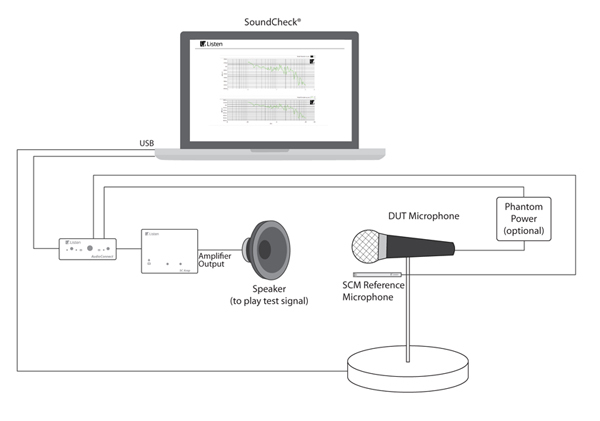 Calibrate the SCM-3 reference microphone as per the instructions in the SoundCheck manual. Position the reference microphone at the desired test location on the turntable stand. This must match the test position of the DUT microphone. Equalize the Source Speaker according to the instructions in the SoundCheck Manual: Calibration Chapter > Speaker Equalization. Even though the equalization of the source is not used in the Mic Substitution method, the calibration of the playback level of the source is. After measuring the reference mic at the 0 degree position, the sequence will prompt you to replace it with the DUT microphone. 2 – Mes – Recall Demo Data and 32 – Rec – Recall curves.